It may be that the only bastion of an auteur is circumstance. A perfect storm allowing a singular vision. But film is of course a facet of capitalism, and it's rare for anyone to either earn the right, or ride a wave of luck, or maybe gain backers via Kickstarter or have a film exec who makes a courageous choice, and make something that ignores 'market appeal' and is something unique and interesting, good and maybe even with that glimmer of artistic merit that provokes thought and analysis and interpretation. 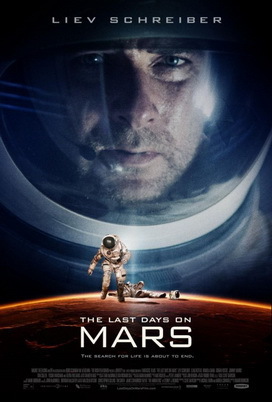 The Last Days on Mars is not this movie. For about the 35 minutes, then another 5 at the end, I thought it might be. It is notably produced by a mish mash of European backers, and an unknown director (in Hollywood anyway), and in this I thought there was hope. This and the trailer, which if you haven't seen yet, go and watch. It speaks of the mysteries of the deep unknowns of space. The outer realms of our imagination, so strange and wonderful that they may skirt the line between the communicable knowable facets of our experience, and everything that lay beyond. And then (and this is not a spoiler) like a slap in the intelligence, it's a zombie movie. Which in itself is fine, tonally, if the movie is what the viewer recognises as being as much. However going in, armed with only the trailer and the choice to use hand-held HD cameras to film the movie, it came out of nowhere. In a Damon Lindeloff age, where dangling mystery tantalisingly before us (Lost, Prometheus etc) appeals to a broad audience, and represents the beautiful genesis of what may produce wonderful movies to come, it was truly a strange choice to see any questions of what is happening answered without a hint of subtlety with 'homicidal Martian zombies'. If it was schlock, so be it, but the pretence of this movie was Kubrick. It had to be! So many referential moments to the deep slow powerful bizarreness of space odyssey…only with space zombies. The HD camera option compound this. Initially it was a nice experience. That this would be the 'look' of a standard camera filming this. It isn't a found footage piece (thank the space zombie god! ), but the feel of this choice, although disarming to begin with, seemed like a good one. Its clinical seeming. Scientific, amidst a group of the best and brightest persevering on the furthest frontier of imagination. Sadly, when the tone changes, and the zombies appear, it seems more like a film school piece (and not a good one) then a solid piece of sci-fi. With all that in mind, I enjoyed it. Not a lot, but I did. For a few reasons. Liev Schriver is wonderful in it. He plays the troubled weary hero in a way that is immensely appealing in the age of Walter Whites and Don Drapers. An underrated actor to be sure. Elias Koteas is always strong, and the supporting cast are also wonderfully cast and add an element of seriousness and purity to a film which, for the bulk of it, is a silly mess. Also, as the credits rolled and the film ended with a courageous choice from the director, I found the part of me which longs for genuine attempts at imaginative and mysterious sci-fi, satisfied. Not as much with what I had seen, as with what was attempted. The constant allusion to Kubrick in Liev Schriver's panic attacks; the close ups on the space suit helmet; the design of the orbiting ship, where in themselves nice, but in the scheme of the movie, completely out of place. Maybe with more character development, more subtlety, this would have been a nice tool. I liked the attempt regardless. And the final moments, the sense of isolation and despair, in a context farther away from humanity then can be imagined, was also strong. It was however, tantalisingly close to what might have been a wonderful movie in the ilk of Sunshine, that fell prey, like the crew, to martian space zombies.